The Asus RT-AC88U Gaming Router is one of the best gaming routers on the market right now, combining excellent network performance with a wealth of great features. These days, it’s hard to find any router that hasn’t embraced the multi-unit mesh Wi-Fi design, which make gaming-centric routers like the Asus RT-AC88U Gaming Router look like relics of some bygone age. 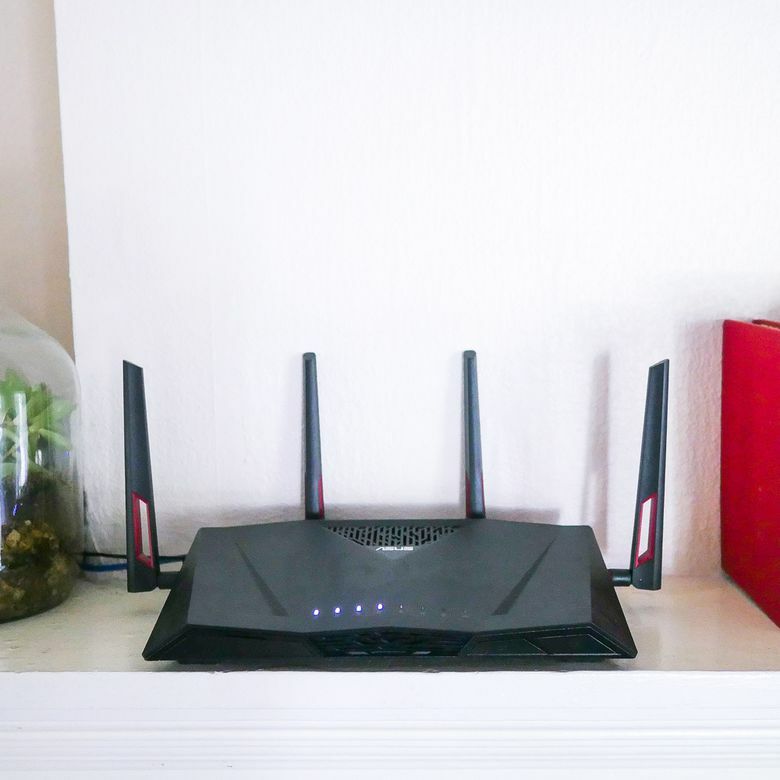 However, you shouldn’t write these single-unit routers off, as they can offer high-end performance, especially if you don’t have a large living space you need to cover. The Asus RT-AC88U, in fact, may be one of the best single-unit wireless routers on the market today, as it offers a respectable range, awesome performance, and a suite of features that make it stand out among the competition. We spent over a week testing it in a home environment, using it with multiple devices for all purposes including browsing, streaming, downloads, and gaming. Most gaming accessories in 2018 look like gaming products. They have edgy angular designs, red accents and bright LEDs. For the Asus RT-AC88U, the first two are certainly true—this router looks like something straight out of Battlestar Galactica. It has a black, angular design with four antennas jutting out of the sides and the back. These antennae have red highlights, making the router eye-catching if you put it in your living room or next to your PC. This design won’t appeal to everyone, obviously, but if it doesn’t offend your aesthetic, the Asus RT-AC88U is capable of some pretty amazing things. Setting up the Asus RT-AC88U is a breeze, which was a bit surprising since most gaming routers take a bit of tinkering. You’ll have to reset your modem, and hardwire it into a desktop computer via the Ethernet port—no smartphone app-based setup here. Then, a portal will pop up in your web browser, where you’ll enter the default password that’s provided with the router. After creating a more secure password, you can run through the setup wizard. The Asus RT-AC88U will automatically detect your ISP and configure settings to get the best performance. All you’ll really have to do is choose your SSID and password and you’ll be good to go. We connected it to our 250 Mbps Xfinity connection, and within a few minutes, after updating the firmware, we were getting phenomenal speeds with little to no fiddling. Ask any gamer, and they’ll probably tell you that wired connections are the only way to go, and that playing online games over a wireless connection is a recipe for disaster. And, generally, we’d have to agree that wired connections are better for online gaming. Luckily, the Asus RT-AC88U is rocking 8 Gigabit LAN ports. This means you can keep your gaming PC, consoles and anything else that needs a solid connection hardwired to your router. But, having all computers in your home hardwired to a router isn’t possible for everyone. So it should come as a relief that wireless connectivity is generally excellent here. The dual-band AC3100 connection, backed up with MU-MIMO support and adaptive Quality of Service, which prioritizes network traffic, means that you can reliably game over a wireless connection as well. A perfect fit in any smart home, allowing you to set up automated programs with a variety of smart devices. The router also features a USB 3.0 port, so you can connect a printer or external hard drive for network access. What’s especially cool, however, is the native Time Machine support built into the Asus RT-AC88U’s back-end, making Mac backup a breeze—something we didn’t expect from a router explicitly marketed to gamers. Unlike many other wireless routers in 2018, the Asus RT-AC88U doesn’t rely on smartphone apps to manage and set-up your network. Instead, you get a pretty traditional browser-based management portal. This might be off-putting to anyone that isn’t comfortable fiddling around with complex settings, but if you want to have that extra degree of control there’s a lot you can do to make your network run how you want. You can manage clients connected to your router, view system logs, change which wireless channels you run on and so much more. The Asus RT-AC88U is a dream come true for the power users out there and is filled to the brim with software features. Chief among these is the adaptive QoS, which gives the Asus RT-AC88U an edge over other routers when it comes to gaming. The router will automatically prioritize traffic from gaming applications — or any other kind of apps that you choose — so that you get the most network performance where it matters. The Asus RT-AC88U also has built-in malware protection, AiProtection, which will allow you to temporarily disable antivirus on your gaming PC, so you can dedicate more resources to the games you’re playing. The router is a dream come true for the power users out there, and is filled to the brim with software features. But, this router does more than just cater to gamers. Built-in Time Machine functionality for Macs, simple cloud storage, and Alexa integration make this router appeal to everyone in your home, no matter what kind of tech they’re into. And, IFTTT integration (if this, then that) means that this router is a perfect fit in any smart home, allowing you to set up automated programs with a variety of smart devices. When you’re opting for a high-performance gaming router like the Asus RT-AC88U, you get exactly what you’re paying for. When it comes to raw speed and latency, this router performs with the best of them. And, that MU-MIMO (Multi-user, multiple input, multiple output) compatibility means that you can have a dozen devices all sucking bandwidth at the same time without bottlenecking each other. In fact, we decided to put this to the test. We set up a desktop, a MacBook Pro, a smart TV, a tablet and a Windows laptop, and had them all stream 4K video at the same time. Even in this stressful scenario, we didn’t run into any buffering, and had smooth video playback. If you live with several gamers and tech addicts like we do, the Asus RT-AC88U will be able to keep up without breaking a sweat. Everyone can do whatever they need to do, without inconveniencing other people in the house. Unfortunately, the Asus RT-AC88U Gaming Router doesn’t have the same range that comparable mesh routers have, and you likely won’t be able to get a strong signal across a large home or office. But, that’s not what this router is designed for, and in our average-sized home we didn’t have any problems with the router’s range. We were able to get reliable speeds in the upstairs bedroom despite the router being placed in the living room downstairs. Right after setting the Asus RT-AC88U up, we wanted to put its gaming capabilities to the test – was it actually better for gaming, or was it just a marketing ploy? Well, it’s definitely better for gaming than your average router. We played Overwatch over a wireless connection, while watching Netflix on three different devices. We didn’t see a single lag spike. The adaptive QoS feature we mentioned earlier was able to ensure that latency was kept to a minimum, even while we were using a significant amount of data at the same time. But what’s more surprising is that this QoS prioritization didn’t get in the way of the streams themselves being smooth. The Asus RT-AC88U isn’t just going to be great for anyone looking to minimize their gaming downtime, it’s going to be great for everyone in the household. You can eliminate arguments over bandwidth entirely — everyone can do whatever they need to do, without inconveniencing other people in the house. The Asus RT-AC88U is not a cheap router by any means, and you’re paying a premium for the gaming-centric features this router boasts. And, we don’t really have a problem with this. At $299, it’s pricey, but not so much that it’s out of reach for large, multi-device households that really need its features. This router offers some of the best performance you can ask for. For smaller households, the features won’t really justify the price — not to mention the design that makes it hard to not notice. These days, devices like the $129 Google Wifi make a lot more sense for the average consumer that doesn’t need heavy-duty networking. But if you do need a heavy duty router like the Asus RT-AC88U, $299 is a small price to pay for the quality of life improvement. The Asus RT-AC88U isn’t the only gaming router out there, in fact, there’s been a deluge of routers focused on gaming over the last few years. And, some premium gaming routers like the Netgear Nighthawk Pro Gaming XR500 give the Asus RT-AC88U a run for its money. But at $297, Netgear’s gaming router is about the same price, and it offers a more user-friendly software solution on top of similar MU-MIMO and QoS functionality. In fact, these two routers are so close together in a performance that picking the one that’s best for you will almost entirely depend on aesthetics. Read more reviews of the best wireless routers and the best secure routers available to purchase online. One of the best routers for gaming. Beyond jumping to a wireless mesh system, which brings problems of its own, this router offers some of the best performance you can ask for. It’s a great choice for anyone looking to squeeze out all the potential from their broadband connection. Product Dimensions 3.3 x 11.8 x 7.4 in.